Please Note: In order to import data from MODFLOW .HDS files, the source file must exist in the folder that contains all associated MODFLOW data files, e.g., .DIS, .NAM etc. •Select 3D Gridded Data from the Data Type drop down list. •Next, select the Coordinate System of the 3D Gridded data. If the coordinate system is different than the one defined in the project settings, VMOD Flex will perform a geotransformation, converting all coordinates to the project’s coordinate system. Click the [Next] button to continue to the next step. The next step allows you to specify how the gridded data is to be imported. When importing a .HDS file, the Gridded data for existing grid option will be automatically selected. The grid dimensions in the source file must be identical to the dimensions of a grid in your project. Select the existing numerical grid from Conceptual Model tree, and then click the button. When importing a .DAT file, the Gridded data for existing grid option will be unchecked. 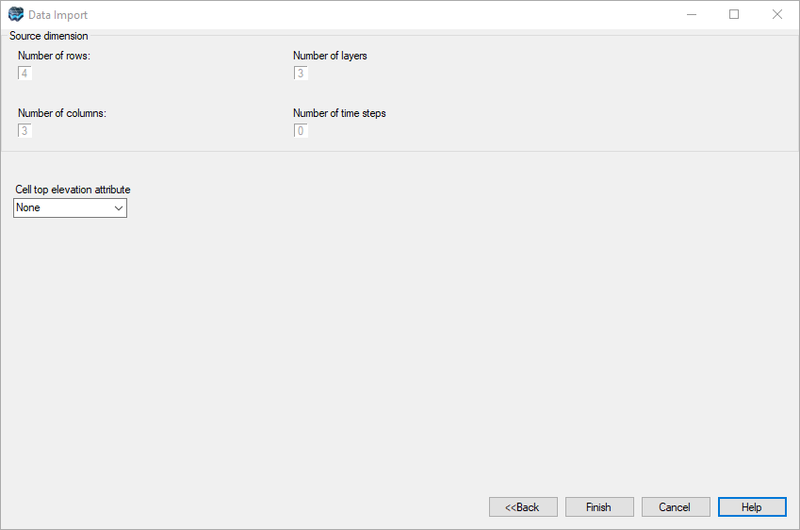 When this option is selected, the Grid Origin frame will display. If the gridded data is in model coordinates, specify the Grid Origin and the degree of Rotation. If the grid is in world coordinates, you may leave the grid origin as is. For both file types, you can specify the grid resolution. 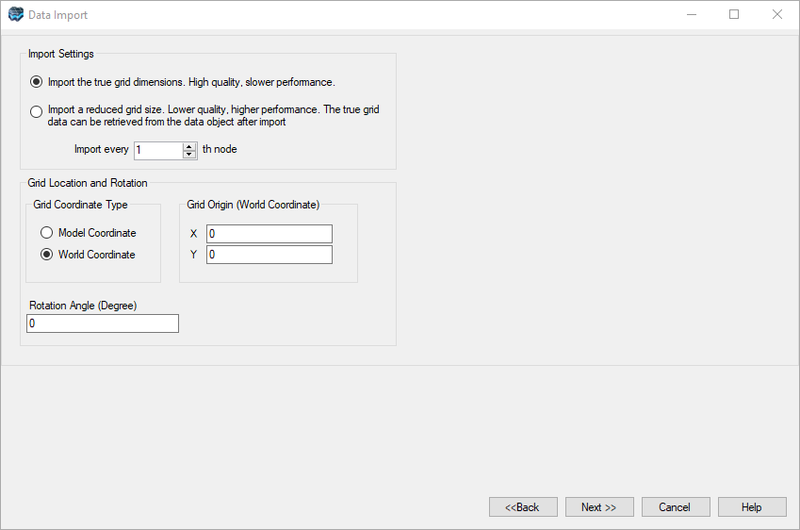 To import the full grid dimensions, select Import the true grid dimensions option. Please Note: Depending on the performance capabilities of your computer, 3D Gridded data containing large volumes of data may take a significant time to import. 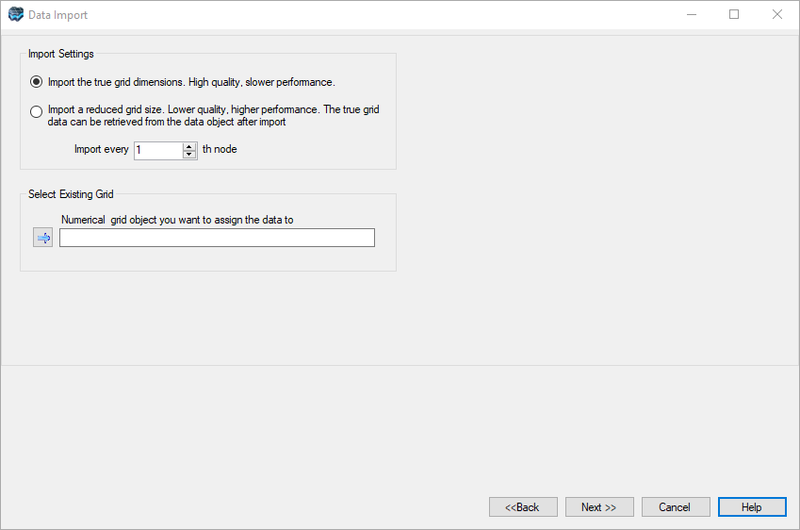 To improve importing and viewing performance, select the Import a reduced grid size option, and specify a value in the Import every nth node box. For example, if a value of 2 is defined, then VMOD Flex will only display every other node in the 3D grid. 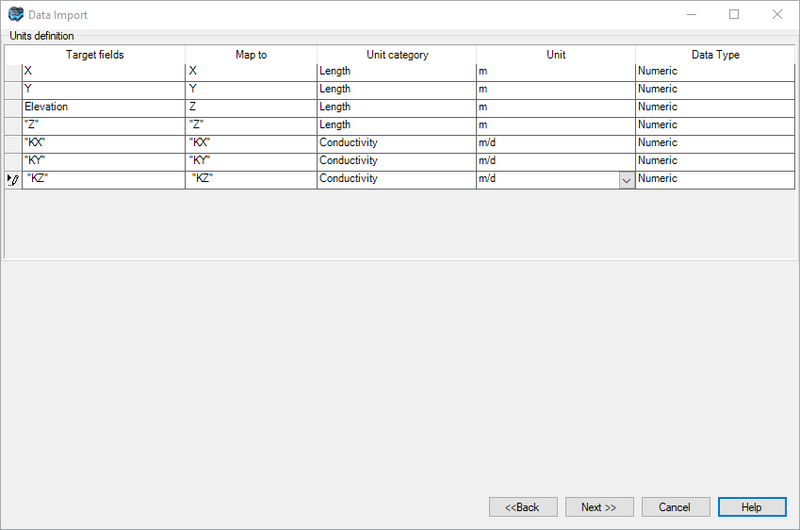 Next, select the appropriate Data Category, Unit and Data Type for each of the mapped attributes. The final dialog in the import process for 3D Gridded shows the grid dimensions of the source data. The Source Dimensions frame displays the Number of Rows, Number of Layers, Number of Columns and Number of Time Steps in the source data. Finally, click the [Finish] button to import the 3D Gridded data.